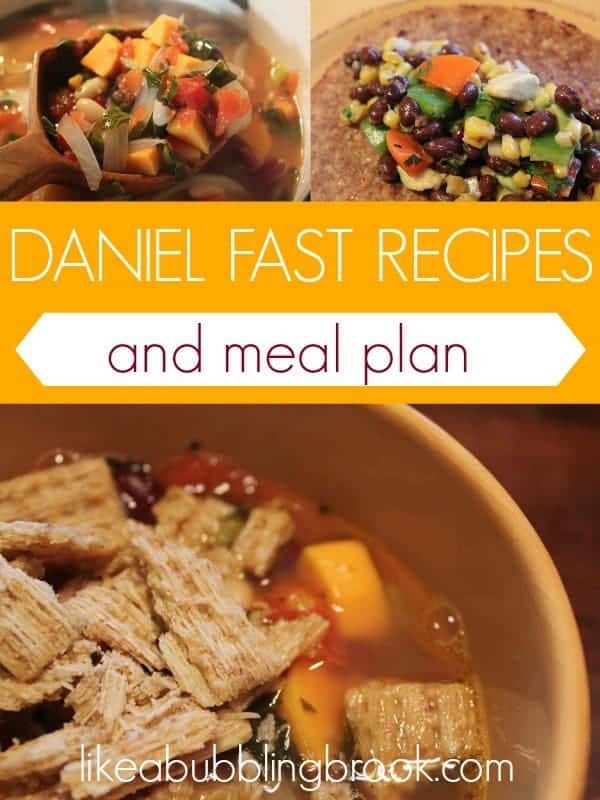 Looking for free Daniel Fast recipes and a meal plan? You’re welcome to use mine! I’ve included breakfasts, lunches, dinners, and snack ideas. Recipe links are included as needed. Enjoy! Monday marks the beginning of this year’s Daniel Fast at our church. We will be abstaining from all meats and animal products, as well as from sweeteners, baked goods, and leavened breads. Last year, my husband and I personally permitted a nominal amount of honey and pure maple syrup in our fast, but this year we will completely go without. There will be no artificial preservatives, processed foods, deep fried foods, etc. Our diet will consist mostly of fruits, vegetables, beans, grains, and nuts. Our only beverage will be water. There are many helpful, in-depth books on the Daniel Fast if you’re interested in learning more; you can find them here. You also might like to deepen your fast by keeping these Daniel Fast scripture cards on hand, too. The Daniel Fast closely resembles a whole foods cellular cleanse we do each year for health purposes, and we’ve really needed to cleanse after all the holiday treats we’ve enjoyed the last six weeks or so. As difficult as it is, I’m looking forward to this fast! We need it, both physically and spiritually! It’s a big year, there’s much to do, and grand plans are ahead of us. Through it all, I’ll be praying for you. Some of you really struggled through the past year, and I’m believing this new year will be a year of breakthroughs in your homes, marriages, and families. I want this site to be an oasis of hope, healing, and truth for you, a place where you can find inspiration and encouragement and feel Him stir your soul and tug at your heart. My heart’s desire is to be in tune and connected with Him throughout this year and every year He graciously gives to me. I’m so glad you join me here, and desire to be connected with Him, too. I hope you’ll enjoy all our Daniel Fast recipes. Hi, Jaime! I know God is going to do great things in your life as you seek Him during your fast. Is there any certain reason that you do this fast? For religious reasons or just use it as a guide in fasting? Kristen, thanks so much for the resources. I'll be sure to pop over! Nabila, we personally do it for both spiritual and health purposes. There are several instances in the Bible were fasts were done either corporately or privately, see Matt. 6:16-18, Matt. 9:14-15, Esther 4:15-16, Isaiah 58:5-7. Those are just a few… and the book of Acts also outlines great moves of God that came about by a combination of prayer and fasting. Hope that helps answer your question! Hello my friend, thank you so much for posting this! Brandon and I will be doing quite a bit of fasting the next two weeks and we have gone back and forth about what kind of fast to do. Neither of us have ever done the Daniel fast, although we have many friends who have.this seems like the perfect fast for mommies who need some energy! Ha 🙂 thanks for th info! Hi Jaime, new follower via MPM. Your recipes look yummy, thanks for posting! Hi Jaime! Thanks so much for complimenting me on my family! I appreciate you stopping by my blog…and I hope to start posting again soon. 🙂 You also have such a beautiful family!!! I think we need to look into doing this, to get ourselves back on track after the holidays. Too much white stuff in our diet recently, white flour and sugar. Thank you for this post, it really is an encouragement, I know when we deny our flesh it is only for our good, physically and spiritually. Really enjoying your music at the moment. So beautiful! May the Lord bless you during this fast. I give you credit! Blessings! This is such a great reminder to take care of our bodies. It reminds me a lot of my mom's concept of a healthy diet–it sounds just like our menus growing up! She did let us have honey and a little bit of sugar and meat, though. She based a lot of her ideas on scriptures, and I actually think it was really good for us. I have definitely let too much sugar creep into my diet! Fixing that is a great goal for 2011! Jaime, I enjoy fasting for physical as well as spiritual purposes. May the Lord bless you and your husband as you seek more of Him. I'm so thankful to find this post via Raising Homemakers. This is the first time I'm participating in a Daniel Fast & it's very difficult. I'm very encouraged to read your menu ideas & to know so many others are participating. My pastor called a 21-day fast to be completed in January, and many of us are doing the Daniel fast for it. Thanks for the meal suggestions for it! Terrific post. I’ve heard of this fast, and I’ll be following you through it. There are many Biblical examples of healthy living and eating, and fasting. This is interesting. God bless you in this effort. I’ve been following you for a couple of months! I’m starting my subsctiption to mvelopes in January and was already planning on doing a Daniel fast, but so happy you have information on it too! Thank you!